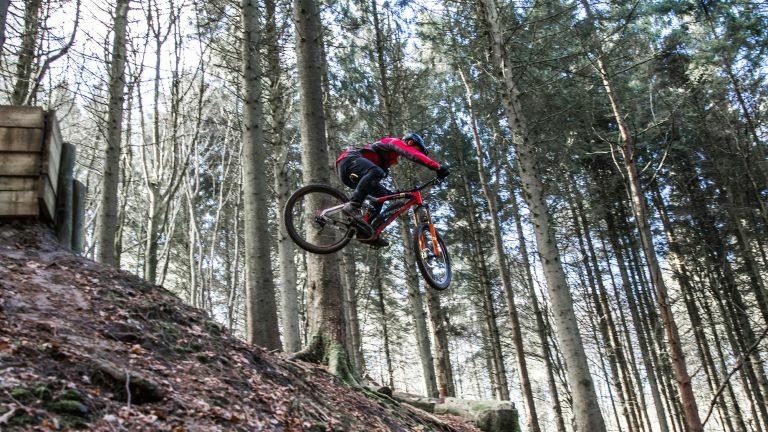 Freeride mountain biking is the epitome of extreme sport, involving big jumps and high-octane tricks that most of us wouldn’t attempt in our dizziest daydreams. Freeride Mountain Bike World Tour winner Sam Pilgrim is one of the UK’s biggest freeriding success stories, regularly hitting the podium at events, so he’s got major form in this area. An ambassador for Haibike, a leading e-performance brand, Sam shares his two-wheeled high jinks with over 190,000 subscribers on his YouTube channel, shooting three videos a week using a brace of GoPro cameras and accessories. “When I joined Haibike, people couldn’t believe it. But then I started doing backflips and 360s, and all these tricks that just hadn’t been done on ebikes before. People are slowly coming round to it – and are now wanting one themselves. “I’ve done normal bike tricks for so long. With the ebike I have to really think about how it’s all going to work. It’s a bit scarier, but I’ve been surprised by how well the bikes work. The added weight helps with jumping in general. “The wind doesn’t affect me as much now because the ebike's heavier. And the stability, because of the weight, is really noticeable. For cornering, the weight is lower down because of the battery, and the motor’s in the bottom bracket, so it helps with corners." “The electric mountain bike I use most is the Haibike Xduro AllMtn 10.0. The Xduro is the more extreme head angle range of Haibikes. That means they’re better for the faster, crazier stuff. It’s got a Yamaha PW-X System motor and Lithium Ion 500wh battery. Battery life depends on the mode you’re in, and each mode gives you a different amount of power. “You’ve got Plus Eco, Normal, Eco, Standard, High, then XPW, which is the top mode. If you’re in XPW you’re able to travel a distance of 75km. If I was to change to the lowest mode, I could do up to 206km of assisted bike riding, which is pretty crazy. “The XDuro AllMtn 10.0 is the shortest suspension travel Haibike has. I like the bikes to be small so they’re more manoeuvrable. I do flips and 360s and other stuff on that bike, so the less suspension means it’s easier to jump because I don’t lose speed while going up the take-off. “I’ve been sponsored by TSG since I was 16. When you’re sponsored, people assume you have to say that stuff’s good, but I wouldn’t use something if it sucked. TSG has always made the comfiest helmets. They’re safe, have the correct certificates and are decently priced. “There are three different kinds of mountain bike helmet I use from those guys. If I’m doing slopestyle jumping on my non-ebike I use TSG’s The Evolution. If I’m doing trail stuff I use the Trailfox helmet. Then if I’m going really crazy with downhill and super high speeds I’ll use the Advance full-face helmet. “I make three videos a week for my YouTube channel, so I use GoPro cameras a lot. I switch between the GoPro Hero6 Black and the GoPro Hero5 Session. “When I travel I’ll have the GoPro Karma Grip gimbal, four spare batteries and an external Shure LensHopper Condenser Microphone. That’s a really good mic. “In my bag I have the GoPro Chest Mount, which gives you a cool shot of your arms coming from the top of the screen, then your bars and the rest of your bike in the centre. “At home I use Final Cut Pro X on a 27.5-inch iMac, and when traveling I use a MacBook Pro with Touch Bar. In my travel bag I’ll definitely have my laptop, and I need a hard drive for all the footage I’m collecting. The hard drive I use is a LaCie Porsche Design 2TB External Drive. Visit Haibike to check out its stunning range of ePerformance bikes, including Sam Pilgrim's choice the Xduro AllMtn 10.0.